Applying for college takes time and effort. Choosing the right college or university, writing personal statements, applying for financial aid and scholarships, and figuring out how to pay for it all can be a daunting task. The Detroit Alumnae Chapter of Delta Sigma Theta Sorority, Inc. and QUAD College Advising are here to help! 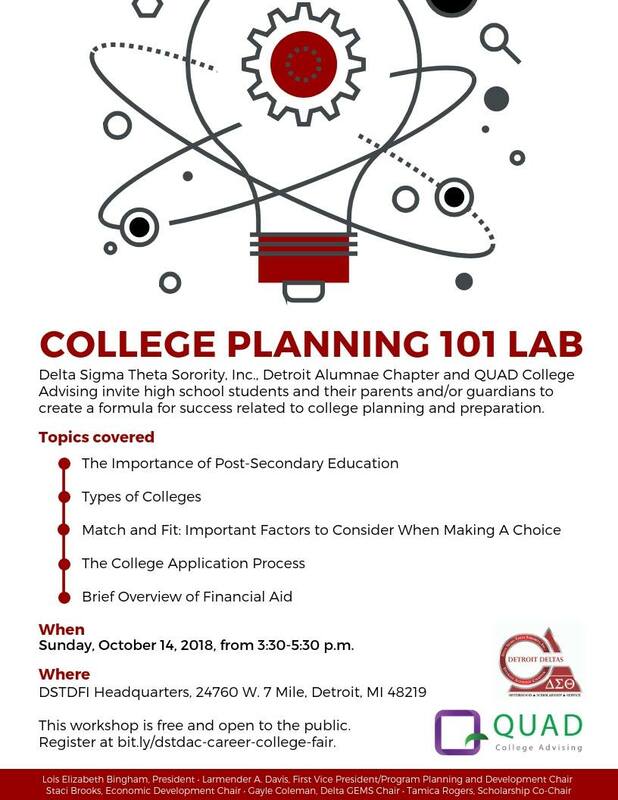 Attend our College Planning 101 Lab at DSTDFI Headquarters on Sunday, October 14, 2018, from 3:30 to 5:30 p.m. and get tips, tools, and resources to help you and your child(ren) create a formula for success when it comes to planning and preparing for college. This event is free and open to the public. To register, visit at bit.ly/dstdac-career-college-fair.